Jack Nicklaus came to the Open at historic Baltusrol Country Club mired in the first serious slump of his career … which he ended in the best way possible. 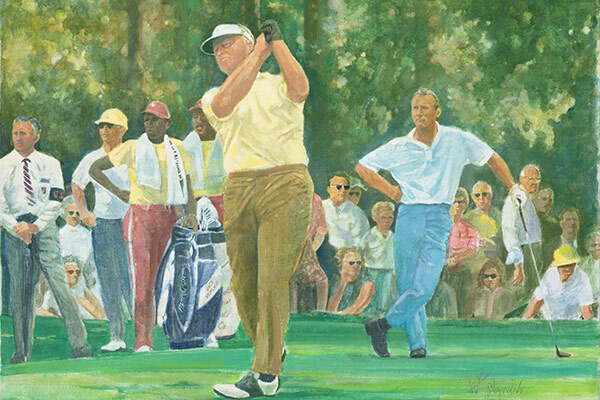 After winning the Bing Crosby National Pro-am in January, Jack Nicklaus struggled to overcome problems with his swing, shotmaking, short game and putting. But with the determination he showed throughout his career, he managed to get all the pieces back in place for the open at this classic A. W. Tillinghast design. He opened with a 71 (Ben Hogan bogeyed the home hole for a 72) and then followed that up with a second-round 67. At the end of three rounds, amateur Marty Fleckman held a one-stroke lead over Nicklaus, Arnold Palmer and Billy Casper. Fleckman skied to an 80 in the final round while Nicklaus turned in a brilliant 65 to beat Palmer by four strokes and set a new open 72-hole record with a 265. The victory and record were punctuated with a 1-iron into the final green from 238 yards out that played more like 260 yards, because it was uphill, all carry, and into the wind, stirred by a darkening sky. The 1-iron carried a greenside bunker and stopped 22 feet from the hole for birdie. So much for a slump.